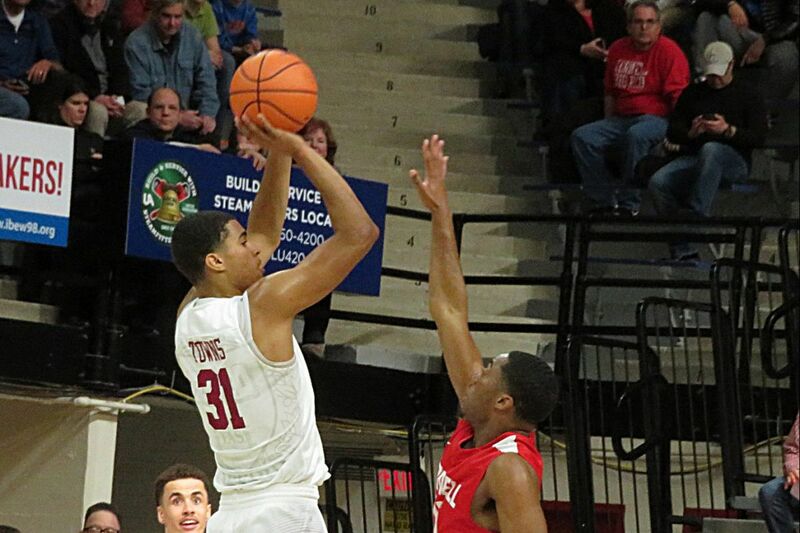 Harvard’s Seth Towns had 24 points and 12 rebounds in Saturday’s 74-55 win over Cornell in the Ivy League semifinals. Tommy Amaker made a public apology after his top seeded Harvard team beat Cornell, 74-55, Saturday, and earned the right to play second-seeded Penn in Sunday's Ivy League championship game at the Palestra. Amaker's apology went to his best player, 6-foot-7 sophomore Seth Towns. Immediately after the game, Amaker wasn't so complimentary to the Ivy League Player of the Year. "I feel a little guilty, because he is the one guy I pointed out in the locker room after the game that could have played better, and I see the stat sheet, and I don't know what to say about it," Amaker said. The stat sheet wasn't misleading. Towns had 24 points and 12 rebounds in 29 effective minutes. His three offensive rebounds were one fewer than Cornell grabbed. For anyone who wants to criticize, Towns shot 7 for 18 from the field, but he was 3 of 7 from beyond the arc while also hitting 7 of 8 free throws. Even though Amaker felt bad about his locker-room comments, he didn't take back all of them. "I just think he can play better, and we are going to need him to play better, and I have that kind of faith and confidence in his game," said Amaker, in his 11th season at Harvard. "Hopefully, he took it the right way, and I told him it was probably a really poor backhanded compliment." If the Quakers have designs on their first NCAA bid since 2007, they need to contain Towns. Penn split with Harvard (18-12) in the regular season. In a 76-67 Harvard home win on Feb. 10, Towns had 17 points and three rebounds in 26 minutes. The player who hurt Penn the most was 6-9 sophomore Chris Lewis, who scored a 25 points while dominating the Quakers with his inside play. In Penn's 74-71 win at the Palestra two weeks later, Lewis was held to 9 points, and Towns had 22, shooting 7 of 10 from the field, while hitting both of his three-point attempts. Towns doesn't force the issue, allowing the game to come to him. "It is one of my roles on the team to stay composed, and in critical moments obviously my teammates have confidence in me to make plays." Towns said. Towns, who attended Northland High in Columbus, Ohio, turned down scholarship offers from Big 10 heavyweights such as Michigan and Ohio State to attend Harvard. He averaged 12.3 points last year and is averaging 16.1 points, 5.7 rebounds, and 12.7 shots per game, which means he doesn't dominate the ball. "He presents a lot of problems with his height, and he is so versatile," said Cornell coach Brian Earl, the former star at Shawnee High and Princeton, about Towns. Penn (23-8) has plenty of other worries in defending Harvard, but containing Towns is at the top of the list. "He is a very talented kid and particularly at his size," Penn coach Steve Donahue said. "They do so much isolation with him." Donahue said Towns' versatility is what sets him apart. "Towns has an array of different shots from different spots, starting with the standstill three. He gets to the rim and makes other shots off the dribble," Donahue said. "You have to continually mix up your coverages."